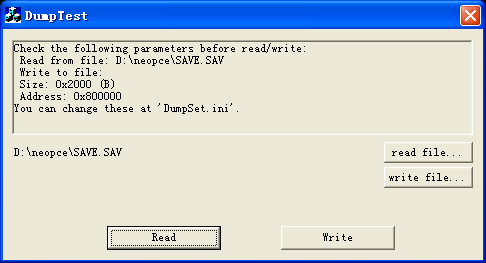  Click "Add" to select some PC-E roms,then press "Write" to burn. 1. How long does the battery last? Can I replace it if needed? I have soldering skills. 2. What other games than populous support gamesaves? "The ram size up to 2MBit" Support "Super CD-ROM2 Games" ? I wrote "Super System Card Ver3.00" to This Cart. And It is displayed that confirm System Card Version. Does this support Super Grafx games? 1. How long does the battery last? Can I replace it if needed? I have soldering skills. --- it's auto rechargeable battery, not need change in whole life. So I can use this with my Supergrafx system and play Supergrafx games? 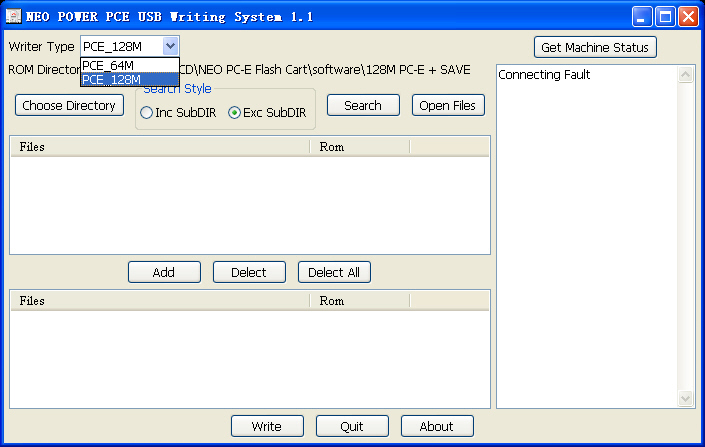 I have tested the other neo flash card with the CD bios v3 on it, and used it in a duo and it works. It would be cool, if the device allowed the duo memory to be backed up onto save, just like the tennokoe bank. Or does it? I have a couple of these but I can use them in my system as I do not have a jap to usa card converter. the speed can be seen! Does the save memory work the same as the duo memory? This card is not recognized by my TURBOEXPRESS. The slim loader works fine, the card is flashed but i got not menu, not nothing on the turboexpress. I used the drivers from NEO2 Ultra Menu V2.1.exe = slim loader recognized, drivers installed, but can´t recognize the card . "Fault connecting" message. I used the drivers from NEO2 Ultra Menu V1.90.exe = warning about drivers are not signed, but drivers works. Slim loader recognized , flash cart recognized. I used the "Neo Power PCE Writer V1.1 SAVE.exe" (my flash cart is a save version)....cart flashed, roms wrote on the card. The TURBOEXPRESS don´t show nothing at all as if i put no card inside. I used the "neopce.exe" (the 1.1 you put the link) ....cart flashed, roms wrote on the card. The TURBOEXPRESS don´t show nothing at all as if i put no card inside. I used the "NEO Power PC-E V1.0.exe" included on the cd.... cart flashed, roms wrote on the card. The TURBOEXPRESS don´t show nothing at all as if i put no card inside. So no menú, no games no nothing. I even put the flash cart on the unit before flash it same way i did with the Neo Myth to see the menu: can´t see the menú. It seems like the roms are there but the flash cart is not recognized at all. Screen shows the same as if i don´t put no card inside. How can i fix this? I think this card is damaged and i will ask for a refund if i can´t find a fast solution. This is not the first time i bought a Neo product , these stuff is expensive and i am not happy about pay near 200 USD (with shipping) just for a piece of plastic. Any idea? Is there any menu i need to flash to the cart same as in the Neo Myth? i'd like buy this card where i came buy from?! i came from italy and i'd like this card in europa if same shops have it....or, i must buy in usa? sameone can give me same shops to buy it? They ship to europe with DHL and its free. i have buy 1 NEO Power PC-E 128M+SAVE super flash cart from www.ic2005.com , i have pay with paypal $149.00+$7.45.when i can seen he track of spedition? when it will be here in italy? Depends on the shipping option you picked. If you picked DHL then you should've received a tracking number in one of the order confirmation emails from ic2005 (titled something like "IC2005 Smart Shop: Your order #nnnn has been completed"). If you picked some other shipping option then maybe they don't offer tracking of packages. Even if you didn't get any tracking number you can probably just wait a few days or a week and the package should arrive. I've never had them not send me something I've ordered. Trying to get any kind of customer support from them is extremely difficult though (e.g. if you want to return a product).